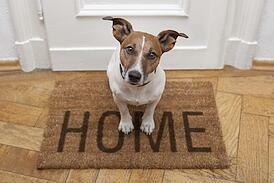 Are you sharing your Springs apartment home with a cuddly four-legged roommate? We love animals and appreciate our furry residents as much as we do humans, but as cute as they are, they don't get a pass on bad behavior. As your dog's guardian, it falls to you to oversee his behavior. Use these tips to help him mind his manners, whether he's at home or out and about in the community. This is one bad habit that will annoy even other dog owners. At some point, you have no doubt had the unpleasant experience of stepping into something nasty and having uncharitable thoughts about the person responsible for it. Don't be that person. To help catch culprits, Springs Apartments uses PooPrints pet waste management service. Don't assume everyone loves your dog as much as you do. According to a 2001 Gallup poll, cynophobia, or fear of dogs, affects 11 percent of Americans. That works out to be one out of every 10 people you encounter. If you need further incentive, many cities have leash laws so you could open yourself up to a citation. Dogs who bark uncontrollably are the most common pet-related complaint of apartment residents. All homes in our Springs communities have private entrances, which eliminates frequent passers-by who may trigger a barking episode from your dog. If he is a breed that tends to be naturally excitable, consider training if you're unable to control his barking. Also consider investing in a bark collar. There are many humane, “zap-free” solutions available. With no outlet for his pent-up energy, a dog is likely to start acting out by barking, creating messes or chewing up items in your apartment. The leash-free dog parks in our Springs communities are convenient areas for both you and your pet to exercise and socialize. Keeping your dog current on his shots is not only for his protection. A healthy dog is less likely to pass on any parasites or infectious diseases. Many people can't resist ooh-ing and ahh-ing over dogs. If your pet is shy or frightened by social contact, don't feel bad about politely asking others not to approach or pet him. In addition to dog parks, pet spas are another pet-friendly amenity available at our Springs communities. Our team works hard to assure that our two- and four-legged residents feel right at home.